As I've grown older, I've learned to appreciate the benefits of a Holy Grail Eye Cream that can do it all: de-puff, diminish dark circles, and hydrate the delicate skin around the eye area. 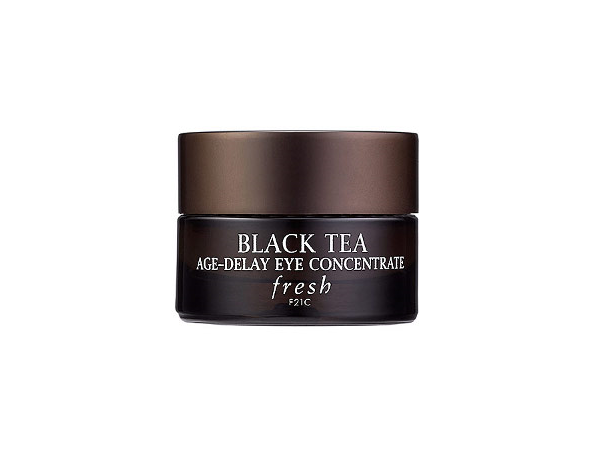 So you can imagine how excited I was to try Fresh Black Tea Age-Delay Eye Concentrate ($100), especially after meeting Fresh co-founder Lev Glazman and hearing him rave about how he and his daughters are addicted to the stuff. I have mixed feelings about this eye cream, which unfortunately fell short of the Holy Grail. It moisturizes nicely and feels cool and soothing immediately upon contact. It doesn't sting my eyes like the last eye cream I tried. The texture is quick-absorbing and non-greasy. I like that the formula doesn't contain parabens, sulphates, or phthalates, and what's more, packs a powerful antioxidant punch thanks to the proprietary black tea complex. But as far as visible results, it has a long way to go to live up to my all-time favourite. My dark circles and puffiness haven't diminished noticeably and still require two different types of concealer in the mornings—even after 4+ weeks of product testing. Should I be getting more sleep, drinking more fluids, and working less? Probably. But if I'd purchased this eye cream for $100 instead of receiving it as a product sample, I'd also expect a lot more. hmm ya I found most eye cream don't live up to what they claim for... sure there is the option of eating more healthy sleeping more and drinking more water... but for the price we pay for eye creams they should definitely do a lot more!! You should try Philosophy Eye Hope. It's the best one I've ever used; my eyes looked so much brighter and more awake the next morning, even the boy noticed!